What do you call two people who make plans to take a 2 1/2 month old baby on a tour of Texas for two weeks? Wait a minute. Did I just hear you call me dumb? I was gonna say “new parents…” but whatever. We did our annual trek to Texas for Christmas and decided we needed it to last two weeks this year. It was rough in the sleep department, that’s for sure. We went from a blissful 10-11 hour night to a h.e.double.hockeysticks-ish waking every 2-3 hours for three weeks! It was brutal. But worth it. 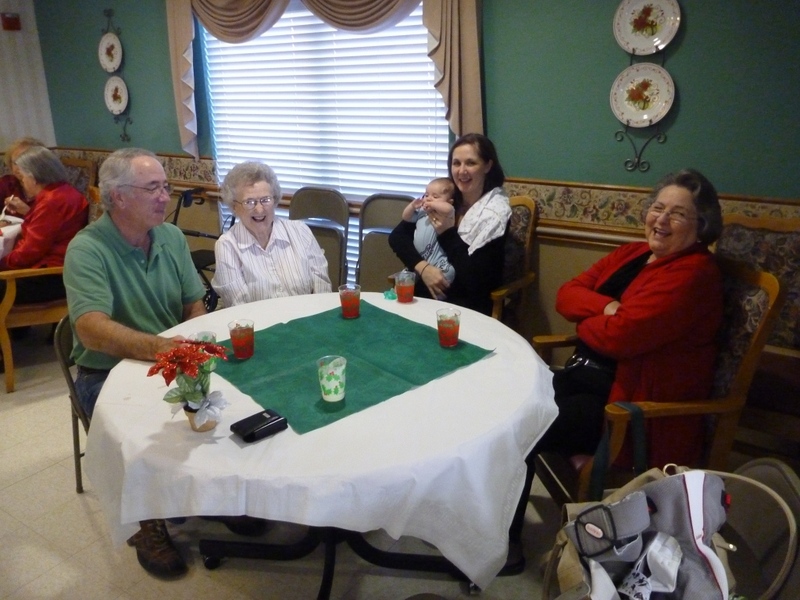 It was fun to visit with so many family members. It is truly amazing how hard it is to pack it in when we are in town. We still never manage to see everyone we want to see. 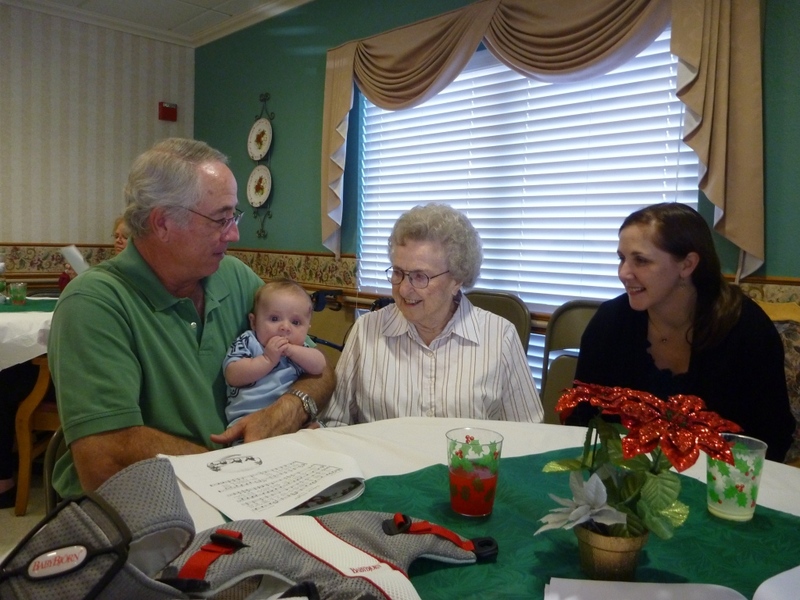 We got to go see Grandma in Fredericksburg (fredburger). 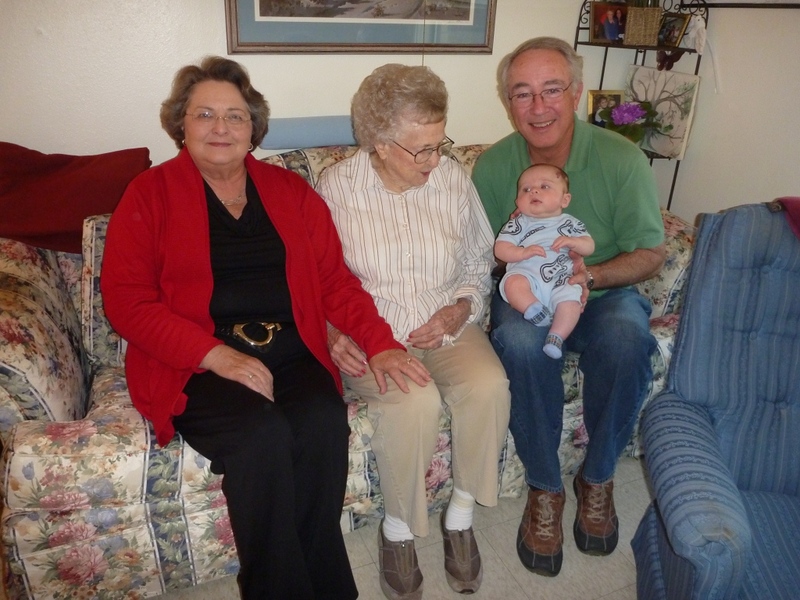 It’s special that Carter had an opportunity to meet his only living Great Grandparent, so many kids don’t get that chance. 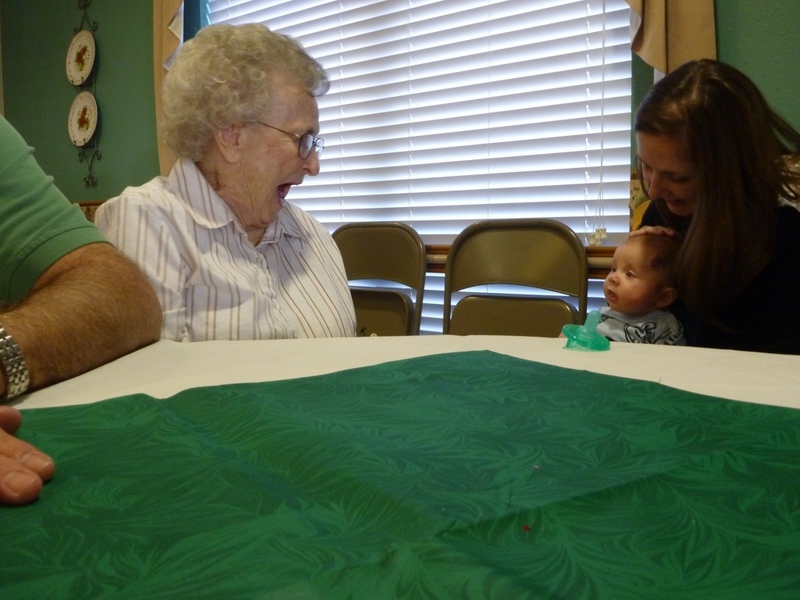 Grandma couldn’t keep her eyes off the kid. 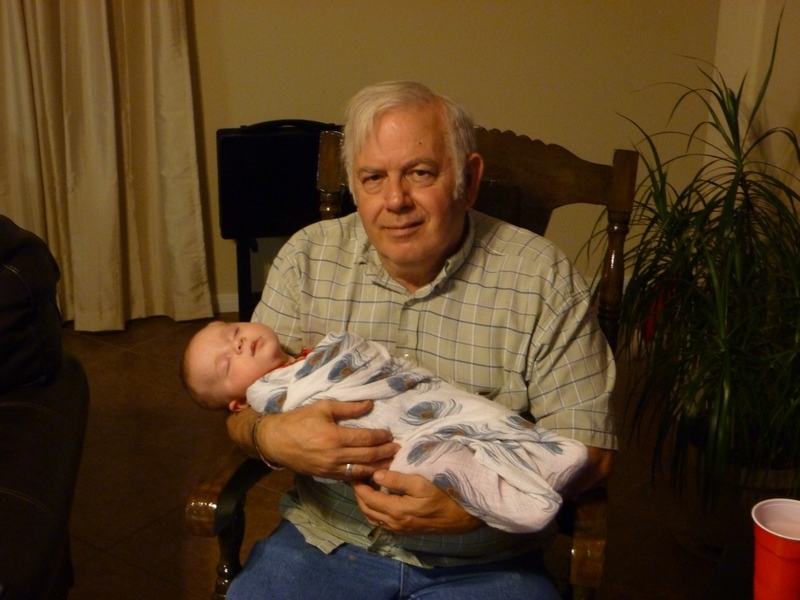 She kept asking his name and when I would tell her Carter Joseph she would tell me all about her son named Joseph while her eyes welled up with tears. 🙂 I’m so glad we went for her Christmas celebration. surprise! there's finally a boy on joe's side! After Christmas dinner was over, we hung out in Grandma’s room for a little while and looked at all of the pictures of family. We also took CJ down to the riverwalk. 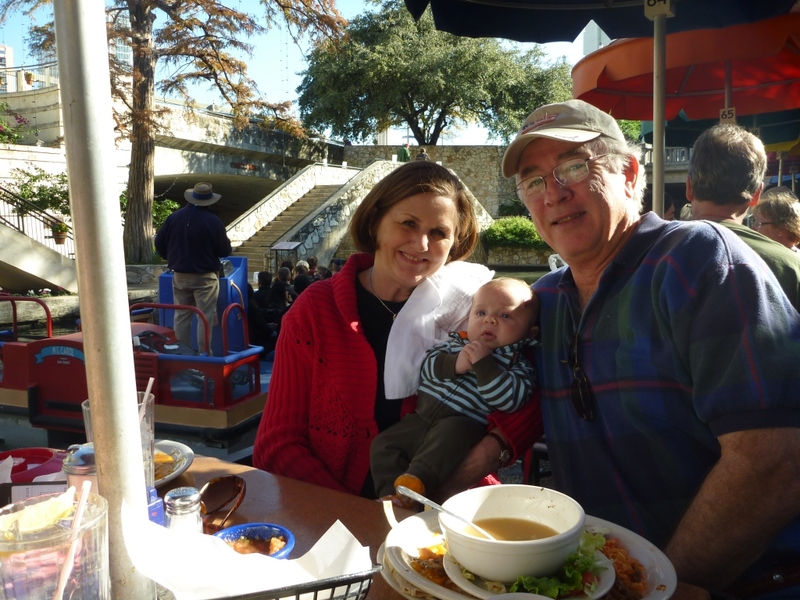 Mom, Dad, Scott and I walked from the Pearl Brewery (went to the fun farmers market down there) all the way to the riverwalk and back. In knee high boots. Awesome. My toes still hurt. 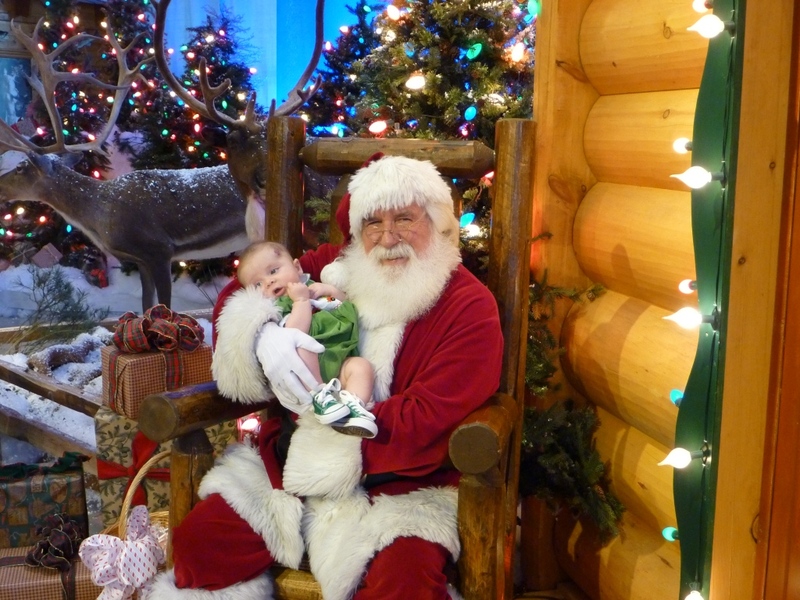 One of the days we decided to go to the Bass Pro Shop to see Santa (he was an awesome Santa). 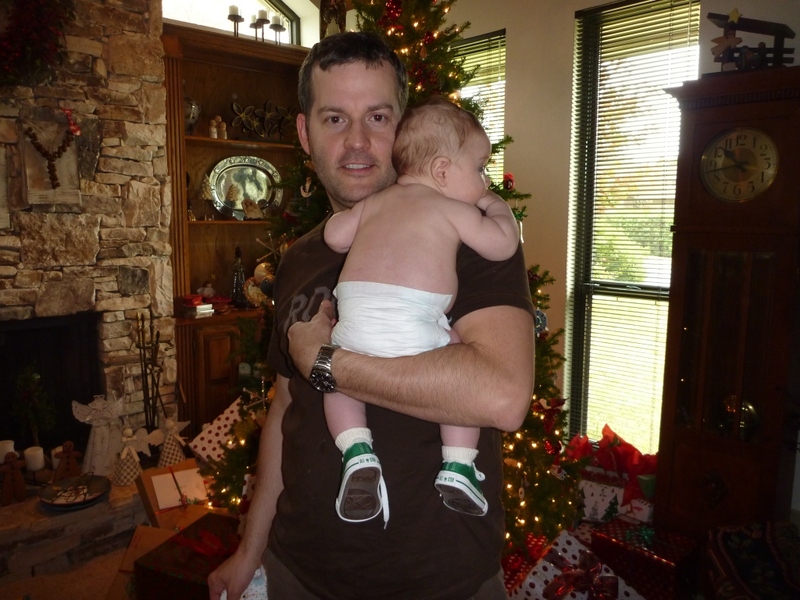 Carter put on his “Christmas Dress,” (a smocked bubble suit, Scott’s favorite choice I’ve made for the kid) and green tennies for the picture. He didn’t seem to mind. He usually will not object to someone warm and wearing something fuzzy holding him. Especially if they have some lumpy, soft parts (like his mom). Piper, on the other hand? 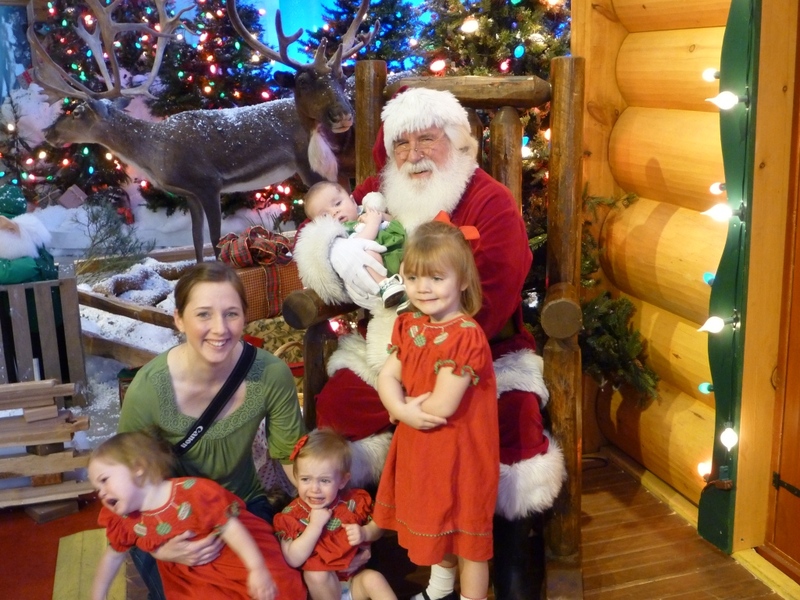 You would think Santa was chasing after her with a hatchett based on that reaction. It was infectious because Katie got in on the terror within seconds. 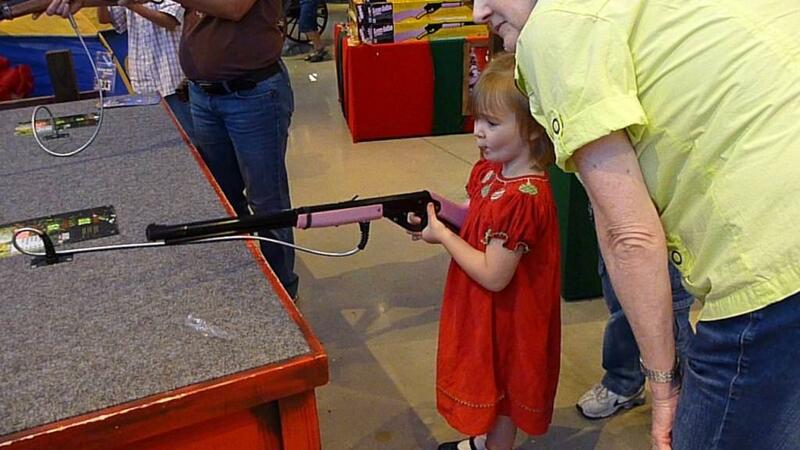 Abby was just a little uncomfortable with her younger relatives’ behavior and awkwardly smiled while noting to herself that she was the only well behaved grandkid. Maybe she could use this to her advantage? 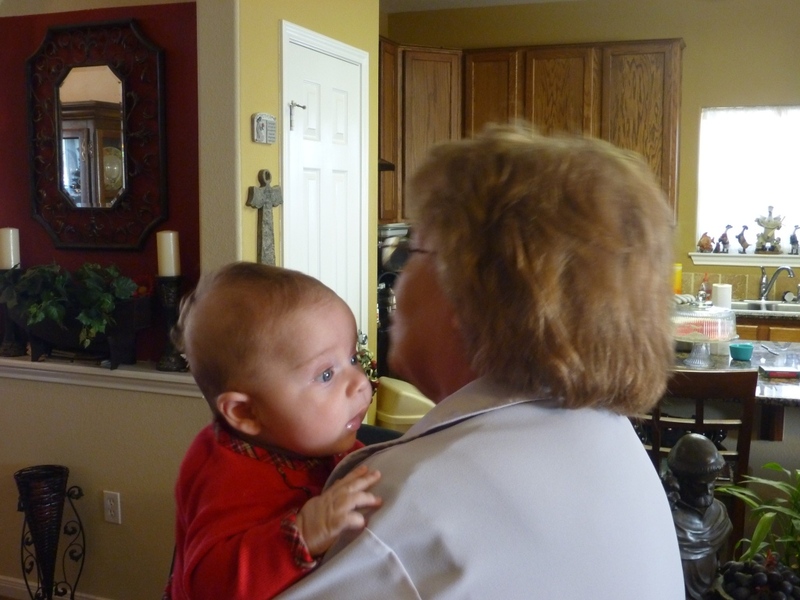 Really she was probably just wondering if she could hold CJ any time soon. Abby got ahead of us after the Santa shoot, we walked around the corner to find her in a fake shooting range with her little pink beebee gun. She couldn’t quite figure it out (probably a good thing), but had fun with the concept of the targets and lights. Abby got a little one on one time with her newest cousin. She really is great at holding him! 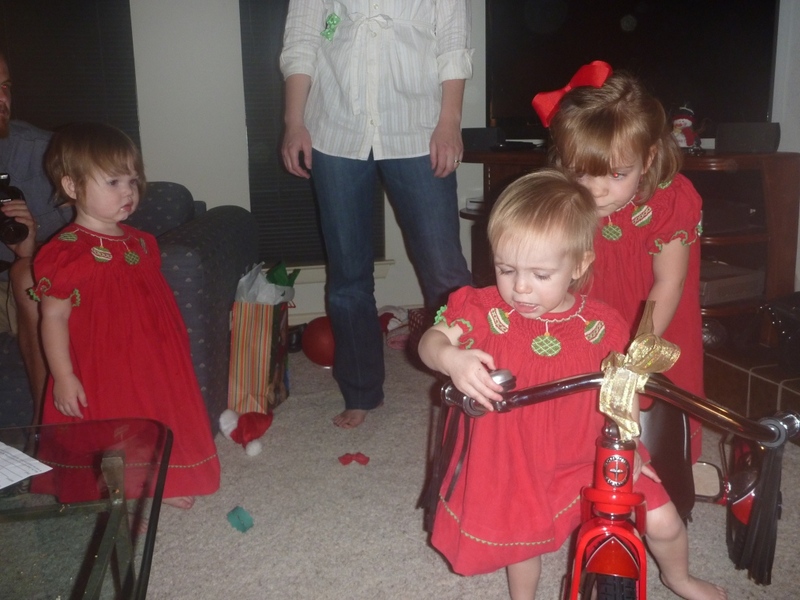 One of Piper’s Christmas gifts was a little trike. 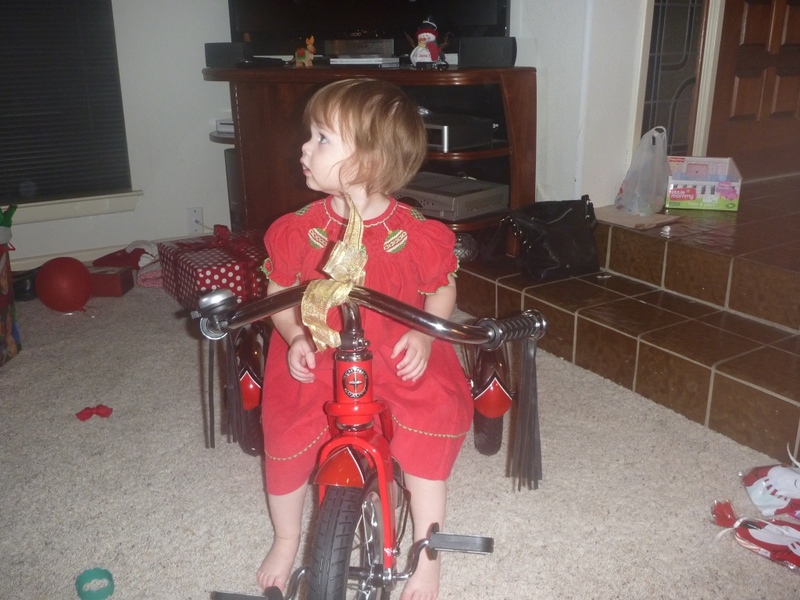 An old school schwinn with a pedestal on the back for a 2nd kid to ride. Well. Katie decided she was the head driver that night. 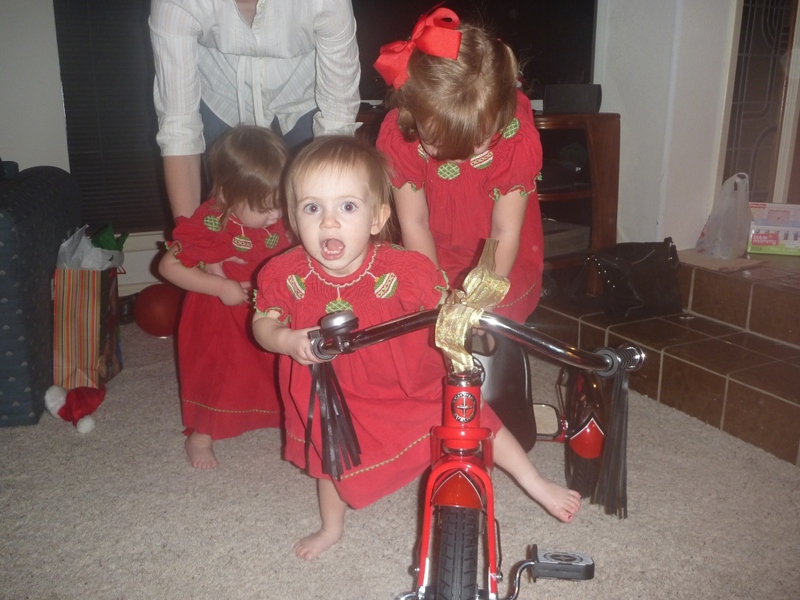 She got on the trike and screamed like a banshee for a minute straight. It was hilarious. And of course, Abby was in the mix of it all. Piper decided that maybe she should step back and let her cousins go crazy. piper: actually, guys? i think it's mine. But took control of the situation and got her little seat to herself finally. The fun is only beginning with those three. They’re hilarious. I’ll have to pull some of the video footage of the “show” they put on for us that evening. With all the mayhem going on, CJ needed a few quiet moments. 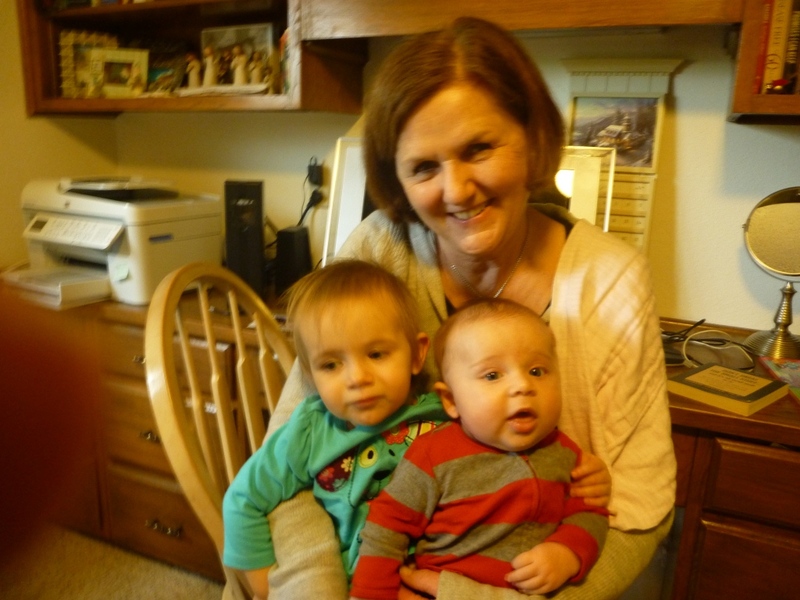 His sweet great aunt Sue helped him with that. She’s a baby whisperer. She can love on those kids well! Katie finally started saying Carter’s name on the last day we were there. She loves her cousin too. 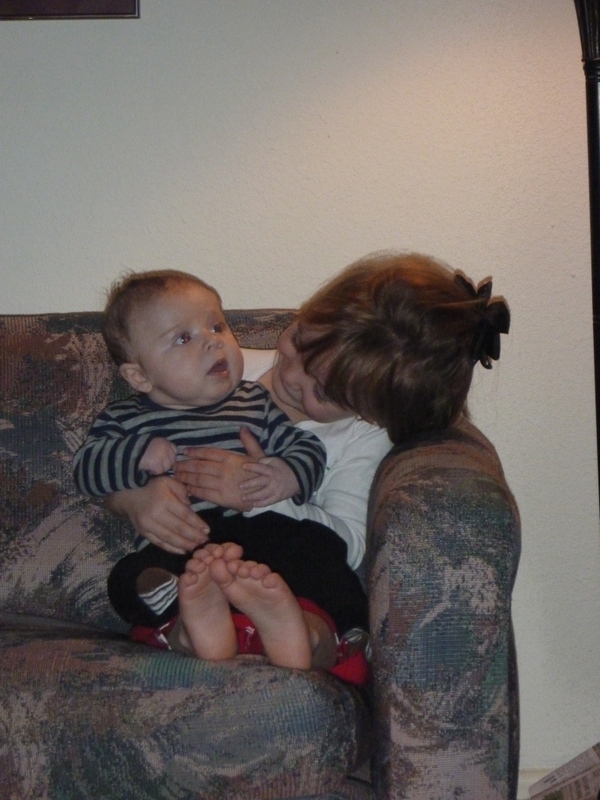 She even put her little arm around “Codah” when Mimi was hanging on to them both. 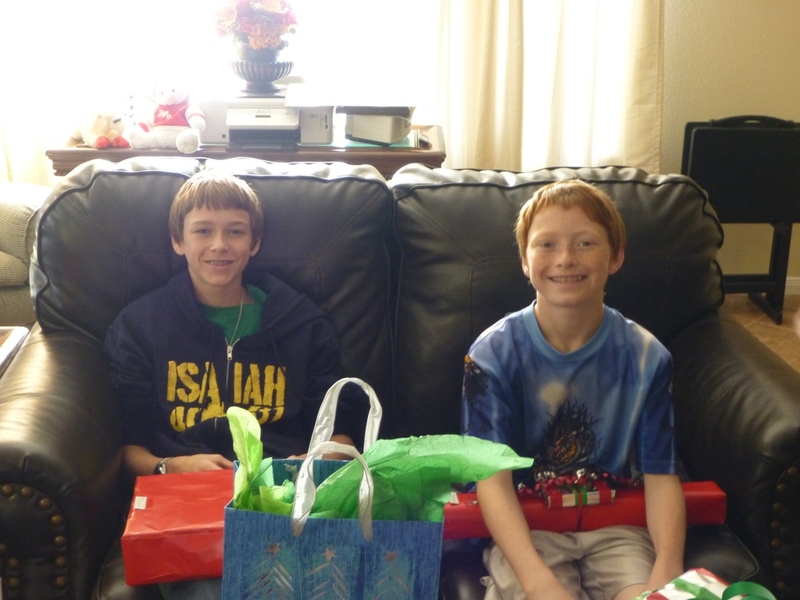 The second half of our trip was in Corpus visiting Scott’s family. 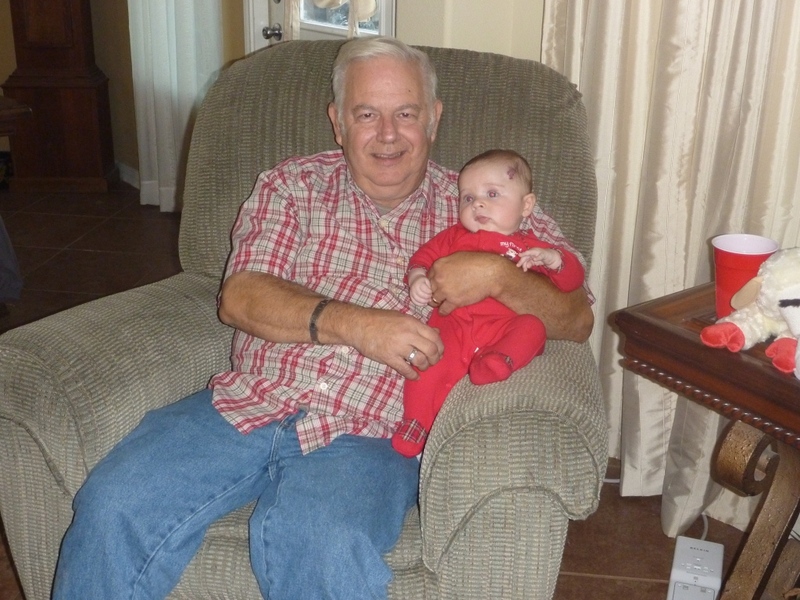 CJ got a lot more time with his grammy & gramps. Like I said, he will never complain if someone wants to hold him. He LOVES to snuggle. And hang out in the recliner watching football (well, he’s not supposed to watch football, but that kid can crane his neck into some seriously painful looking positions to try to catch a glimpse of the tv). He’ll even play light as a feather, stiff as a board while sleeping. 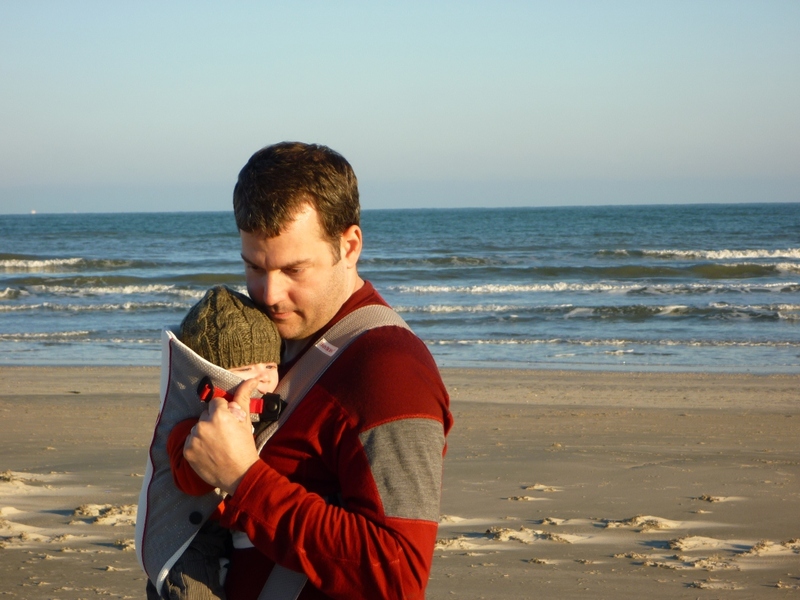 On one brief afternoon, we took him down to the beach in Port Aransas. It was cold. He hates hats. HATES hats. Lots of screaming ensued. He was not impressed with our trip to the beach. Cool pic though. dad. pleeeeeeeeeeeease take me back inside. It is a white Christmas. The snow is falling pretty hard this morning, it’s beautiful. I love how it makes everything a little bit quieter. Scott just made me an Americano and then we’ll head over to Cara & Clint’s for what sounds to be a delicious Christmas lunch! Love all of you guys, Merry Christmas! Today we got out to the store for the makings of a Christmas Eve Feast for the Lpod family. We woke up to some heavy (literally wet & heavy) snowfall of about 4-5 inches. The temperatures are really quite warm – 35° or 36°, allowing for some pretty serious melting, finally! It certainly won’t be melted all the way, we will in fact have a white Christmas! Dessert will be the Gramercy Tavern Gingerbread Cake. My personal winter favorite! Happy Christmas Eve, I hope you are all safe and well! Well, yesterday we decided to go out and about to see all of the leftover snow. It got up to just above freezing for the first time in over a week yesterday, so it really started to melt. Just in time for it to drop below freezing. We decided there is a good 3-4 inch layer of hard packed snow and ice over all of the streets and still about 6-8 inches of snow on top of that! First we had to dig out, thankfully our car wasn’t as buried as some of the smaller ones on the street. This was the same road we drove to get to the airport a few days ago. It is like a solid road of potholes where the ice has broken up. Good thing it’s Scott’s car taking the beating! We went over to Greenlake, we heard part of the lake had frozen over. Much of it melted before we got there in that warm 33° weather, but you can still see the impact of the last 10 days of sub-freezing temperatures. confused ducks. hilarious - they kept slipping and falling, wish i had video! "i can walk on water!!" Ducks checking out the map trying to figure out what happened to most of their lake. Cabin fever is certainly setting in around town. The residents of greenlake were out and about! We saw tons of sledders, speed walkers, runners (that is dedication), and cross country skiers getting their exercise around the lake. the dogs were so happy to be out and about! Some other random shots. It was so beautiful, I couldn’t pick just one. Or two for that matter. We decided to check out Lake Union as well and see if there was any frozen parts. None of the lake was frozen, but GasWorks park was so great (forgot to snap pictures). Below is Interstate 5 at Roanoke. We were forced to get back on the highway because the Eastlake neighborhood had all of the hills shut down. So much snow on the side of the highway. my Christmas present? Awwww, thanks. Tonight another 2 inches or so should come down, with predictions for Christmas Eve & Christmas snow as well, but our temperatures are slowly starting to warm up each day. Hopefully we will have some relief and snowmelt soon so we can get out of town to see some family! Christmas is cancelled. Have a sandwich. My New Years’ Resolution: NEVER try to fly out on the first day of winter. As you can see from many of my previous posts, Seattle has been getting colossal amounts of snow (for Seattle) over the last 9 days. Many people are shut in and haven’t really left their houses in that time – the steep hills of Seattle (remember, the original city was built on the 7 great hills) do not lend themselves to safe travels around town when packed snow and ice are present. The night before we were due to travel down to Texas to visit our families, the snow really picked up. In all, we think we got about 8 inches at our house. Just before heading out the door - recognize our raised vegetable garden? Yeah, buried. Scott is an excellent driver in snow, and thankfully, his jeep is made for just this type of thing. We allowed ourselves about 2 hours to get the 20 miles to the airport, but it took just barely over an hour. A little slipping and sliding on some bridges, but Scott is my hero, he’s a great driver. Aurora by Greenlake. My phone camera does not come close to capturing the magnitude and beauty! We were so happy by the time we got to the airport! We had more than two hours to get checked in, check our bags, get through security and head toward our ON TIME departure! It’s hard to believe, Alaska Air was cancelling tons of flights, but we were still scheduled to depart on time, lucky us! Well…..we got checked in, we checked our bags, with over an hour to kill and I decided I’d run over to the post office box and drop all of my Christmas cards just before getting in the security line. Dumb. Dumb idea. What went into the PO box with my Christmas cards? Oh, MY ID. All the people sitting around (waiting to get rebooked on their cancelled flights) were embarrassed for how stupid I just was. Once again, Scott to the rescue. He went to the dark, scary parts of the airport to find someone who might be able to open the PO box and find my license. Problem solved, the rest of the day is going to be a breeze. We get through security, flight still on time. They start boarding the plane at 10:40am, we happily take our middle seats across the plane from each other feeling like the lucky ones who got a flight and it wasn’t cancelled. Part way through the boarding process, they stopped letting people on the plane. The captain comes on the intercom and says “there’s wind in Houston, and they’ve slowed incoming traffic, we might have to wait 90 minutes before we can take off.” Hmmm, not the foot of snow below us, continuing driving snow, or hurricane force winds in the mountains. Wind. In Houston. Yep, delayed due to wind in Houston, weater is FINE in Seattle. So, we hang out on the plane for about 30 minutes, then they tell us we all have to deplane. We hang out in the terminal, waiting for information. Finally! We get notification we have “wheels up” at 1:30, only a 2:15 delay, I can deal with that. They shove us all back on the plane so we can get the door shut by 1pm when the de-icing truck is scheduled. My wing gets de-iced, covered in all that orangey goodness that keeps us safe. Then it stops. No more, Scott’s wing is still icy and unhappy. 30 minutes pass and we get an announcement “uh, the de-icing truck is broken down, we’ll be up and running soon, we hope.” 30 minutes pass “er, they are still trying to locate a part for the de-icing truck, indefinite delay.” 45 minutes pass, FIRE TRUCKS AND AMBULANCES show up and it appears there might be a FIRE on the roof of Seatac. It felt like a movie. At this point, they tell people they can get off the plane if they want, but warned if they try to rebook, they may not get out before Christmas. The couple I was sitting in between got in a horrible argument about staying or going. AWKWARD! I just played on my iPhone pretending I couldn’t hear (except the time I gave unsolicited advice about how they could get their bags, whoops). They left. I had the whole row to myself, I can handle this for another few hours, we’re totally gonna get home! On comes another passenger who spent the last 20+ hours sitting in the Anchorage airport. My happy row was crowded again. At least my husband got to come sit next to me. Another hour or so, the crew (who was very kind and really handled everything well) decided they were going to bring out hot sandwiches to everyone. A gate agent comes flying onto the plane pushing the flight attendants back, saying she “has an announcement.” Yes! We’re going! We’ll get to Houston tonight, and just drive down to SA. Yes! Nope. Cancelled. Yes, approximately the time we should have been renting our happy car in San Antonio, after almost 6 hours on that (recycled air) plane, our flight was cancelled just after 5pm (we boarded at 10:40am). 😦 That’s ok! We’ll rebook. Tomorrow we’ll get out, right? No. No flights out. Until Dec 28. We all got a little delirious when they started passing around a bag of sandwiches after that announcement. I said “Christmas is cancelled. Have a sandwich.” and we all laughed until we cried. So, it’s going to be a quiet LPod Christmas this year. We were pretty devestated last night, and still sad this morning, but we’re thankful we have a warm house and each other, it could be worse! We hope our fellow passenger who had been in Anchorage gets to his home in Houston before Christmas, there were no hotels anywhere last night. This morning outside our office window. We'll try to get out today and take some real pictures of what's going on! Merry Christmas, I hope you are all safe, warm and enjoying good quality family time. We made plans with Cara & Clint to go check out some of the neighborhoods in West Seattle who put on quite the display of Christmas lights every year. We lucked out and on the way over to West Seattle it started snowing! Big heavy flakes. I’m currently typing while wrapped up in a down blanket looking out at the fresh snow – that is likely not going anywhere. It’s not even supposed to get above freezing until Wednesday – when it’s supposed to snow again! For those of you who know Colorado snow, we call this snow “cement.” It’s very wet and heavy – which makes EXCELLENT snow balls and snowmen. Scott got a little carried away in someone’s front yard and made a snowman. Once you start, just roll it around and collect more snow! Cara's first snowball - EVER! Another beautiful house with lights. I love the white lights on a tree coated with fresh snow. Serene. I think this house was everyone’s favorite. Merry Christmas Charlie Brown! You can barely see on the left of the picture, but Snoopy’s house was decorated just like in the movie. I also didn’t get the piano in there with Linus (just to the right). They have a 50ish foot tree that has a bright star close to the top as well. Beautifully done house! After we finished with lights, we stopped by a yummy place called Shadow Land in West Seattle. We had some warm comfort food (hello, poutine – thank goodness for the French Canadians) and started out in awe at the snow that was still steadily coming down. Great night with C&C!! I thought this storefront looked so perfect with the snowy (not flocked) garland and Christmas lights.